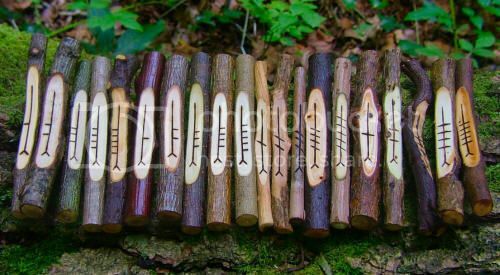 What is your favorite Ogham tree and why? What is your favorite tree in the Ogham and why? For me, my favorite tree will always be beith (birch). everything. Beith is also the lady's tree, and I am a feminist. Re: What is your favorite Ogham tree and why? Hmmm a tricky one, it seems to change depending upon which wants to work with me! I have the greatest connection to Ido / Yew which originally guided me. When I was young my favourite was certainly the Saille / Willow, then during my Bardic work it was Fearn / Alder. although I've been working with a stand of Grey Poplar which is supposedly a hybrid of the two. For me it would without a doubt be Huath/Hawthorn. When I was very young there was a great, wise, old Hawthorn, bearing rich red blossoms the scent of which was exquisite. From the first moment I can recall meeting this ancient I had a deep affinity with it and found always beneath its boughs utter protection and safety, though it established the power of Relationships by proffering greater warmth and welcome when I in turn offered respect and honor, thereby establishing the coexistence of such a bond. This old tree also offered to my young self another aspect of its wisdom, that of Consequences; for when foolishly I clambered high into its great branches and in losing my balance fell, I learned well the results of such actions and that while an idea may seem glorious it does not always come without danger. Contradictions abounded with this relationship as well, for while beautiful, protective, wise and loved, the Hawthorn possessed harsh thorns and more than once in gathering blossoms or breathing in their scent, I would run into the pain of these barbs, thereby learning well that in life the beautiful more often than not comes with pain. Some of the sweetest, strongest memories I possess contain this tree. To this day, when I pass the young white Hawthorn on my land I share a rich affinity with it and often receive a calming instruction from its ancient ancestry. Truth be had, whenever I pass a Hawthorn that bond is there.